Shield Argent, six pomegranates Proper ordered 2:2:2. Mural crown Argent with four visible towers (town rank) and white scroll (Bénard Guedes style) with inscription in black capitals "ROM?SÃ". As "romãs" means "pomegranates", these arms are canting. Romãs Commune was one of the pre-2013 communes of Sátão Municipality; it had 868 inhabitants in 2011 and covered 33.7 km². 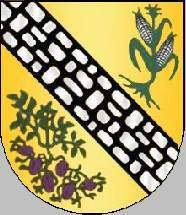 Shield Or, a bend Sable semy of stones Argent, in sinister chief a corn plant Vert with two cobs Argent, in dexter base a potatoe shrub Vert with six potatoes Purpure. Mural crown Argent with three visible towers (village rank) and white scroll with inscription in black capitals "DECERMILO". Decermilo Commune was one of the pre-2013 communes of Sátão Municipality; it had 205 inhabitants in 2011 and covered 4.4 km². Shield Argent, a bendlet wavy Azure, in sinister chief a grapevine Or leaved Vert, in dexter chief hammer and mallet Sable hilted Gules. Mural crown Argent with three visible towers (village rank) and white scroll (Bénard Guedes style) with inscription in black capitals "VILA LONGA". Hammer and mallet are symbolizing mining, the grapevine viticulture. Vila Longa Commune was one of the pre-2013 communes of Sátão Municipality; it had 186 inhabitants in 2011 and covered 8.0 km².